At New Hope Initiative's medical clinic in Arusha, Tanzania lives are changed on a daily basis. Of our 25,000 annual patients we have stories of amazing transformation very often. One of our more poignant stories occurred recently in the life of an older gentleman named Mr. Sikn. He for many years had a cyst growing in his forehead. Not only was it painful but it was unsightly causing him to be ostracized in his community and even to be ridiculed as demon possessed. Mr. Sikn visited hospitals and doctors for miles around his rural home, however, because he was poor and had no money, he could not find any one to help him. Finally he heard about our NHI clinic in Arusha and, even though it was hours away from his home, he heard that this clinic would effectively and compassionately help people who were poor. 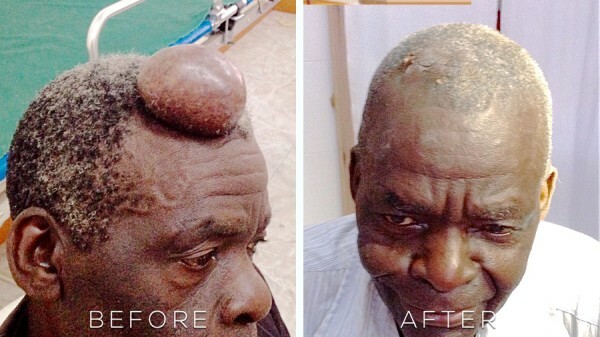 You can see from these amazing photographs the incredible job Dr. Byemba did in this surgery. We talk often about changing people's lives but truly Mr. Sikn's life as forever been changed by Dr. Byemba and New Hope Initiative.